I've never counted the number of dog books I've collected throughout the months. To my surprise, I've accumulated more than a handful. So I'm making June my dog book reviews month. It's been more than a year since I took blogging seriously. I also wanted to participate in dog forums to be able to contribute to our community. It wasn't just right to share my experiences, I also wanted to help others in any way I could. 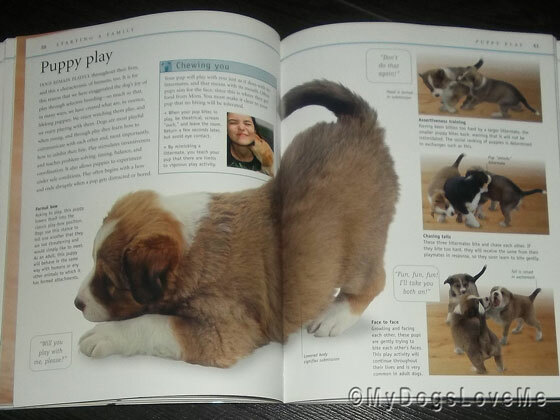 In order for me to do this, I thought it was essential for me to learn the basics of dog behavior. 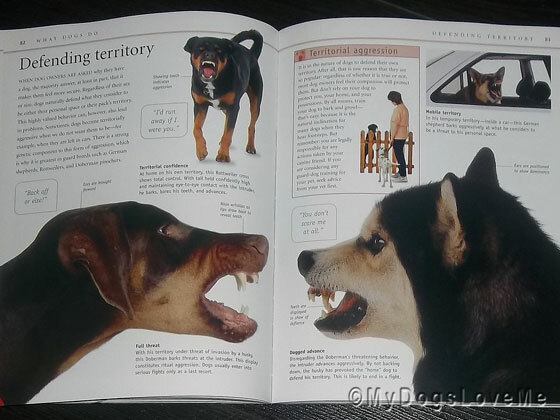 This page explains why dogs defend their territory. It's "subbed" in human perspective. Terms like dominance, territorial aggression, boredom, spaying, neutering, potty training, puppy parenting, and other dog-related terms are just some of the topics I love reading about. So with no further ado, I'd like to share my very first book. This is my first dog book. It has been with me for more than a year now. 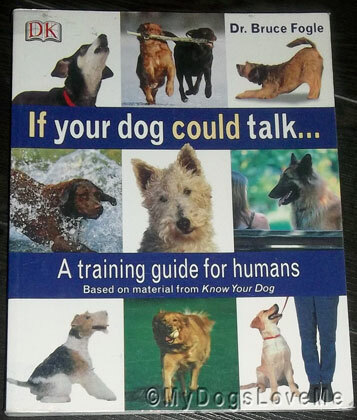 This is Dr. Bruce Fogle's If Your Dog Could Talk... A training guide for humans. I also found this same book sold in one of the major bookstores in our country. I guess it's a good buy. Who could resist puppy pictures?!? I have to admit that the most important reason why I love this book is because of the pictures. The first time I read it, I only scanned the pages while reading the caption of each picture. That alone was very informative. Amazingly enough, I learned a lot of dog behaviors and body languages by reading If Your Dog Could Talk. Look! There's a Snoopy-looking fellow at the bottom right corner. If I was asked whether it was a great find for me, I would certainly say yes. 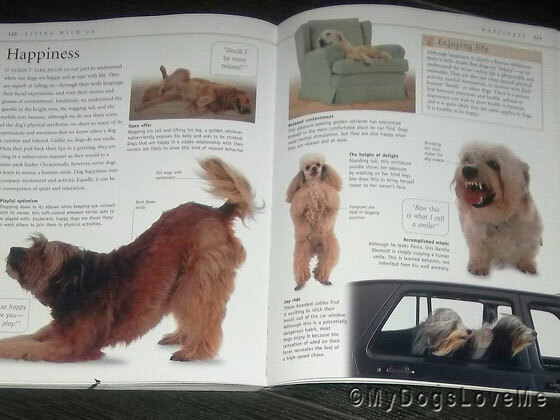 The dog pictures helped me in identifying the signs of certain dog traits while the worded explanations expanded what those pictures said. This is also one of the books that taught me about the history of dogs. What scientist believe their origin is, how they evolved and how they were domesticated. Would it be a good starter book for a novice dog owner? Yes! One of my favorite lines in this book happens to come from Dr. Fogle's foreword. "In that sense, let me say right now, before I go any farther, that if you want an obedient, responsive, and well-mannered dog, do as I say (in the following pages), not as I do." "... I look at her pleading eyes and can't help but let her behave as her canine abilities compel her to." So there you have it. Oh, I wasn't paid nor sent a copy of this book to review. I just wanted to share it with you. P.S. Chooey wasn't injured again. That's a freshly bandaged muzzle because we brought her to the vet to have it changed. She charged us about $7 for it. We talk all the time....don't all dogs? But you are right, humans just don't understand sometimes. Wow... Now, can we teach the peeps to talk back? LOL we agree with him we are more the sucker for those eyes. Have a marvellous Monday. Thank you for asking about Pip. That must have been an old post as yes they were both ill but both are OK now. At 15years plus it took a lot out of her but she is fine now and we just make life easy for her. She still loves to sit in front of the camera as it means treats but we don't do too much with her but she finds a little bit fun. I have Bruce Fogel's vetinary book and it has been invaluable to me if the pups aren't feeling well. I would love to know what the dogs are thinking (probably gimme the food) LOL. Bruce Fogel is a well known vet in the UK. His son, Ben, is a high profile tv presenter who goes in for extreme sports/adventures and does documentaries! That's a relief that the bandage on Chooey wasn't for a new injury. Phew! Interesting! I'm going to look into this book. thanks! It sounds like a very good book to me! Awesome! I know I have two huge stacks of dog books I've been meaning to get to, now you're my inspiration to get those bad boys read and reviewed! How wonderful of you to share your book collection. We agree that learning to read our body language and talk our "speak" are so very important to understanding our behaviors!